Greengraves townland is situated between Dundonald and Newtownards, in County Down. Just like Ballycullen, it is bisected by the Kempe Stones Road (A20). 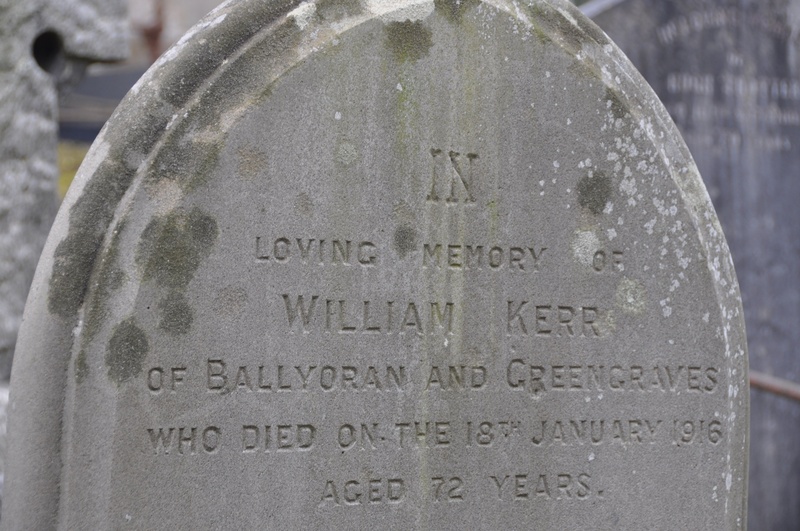 Armed with those two names – Greengraves and Kempe Stones – you shouldn’t be surprised to see this in the townland. These are the Kempe Stones. They were placed here five or six thousand years ago, one of many Neolithic monuments built along the eastern coast of Ireland. That is plenty of time for the origin and purpose of things and names to be obscured. Let’s start the Kempe Stones themselves. 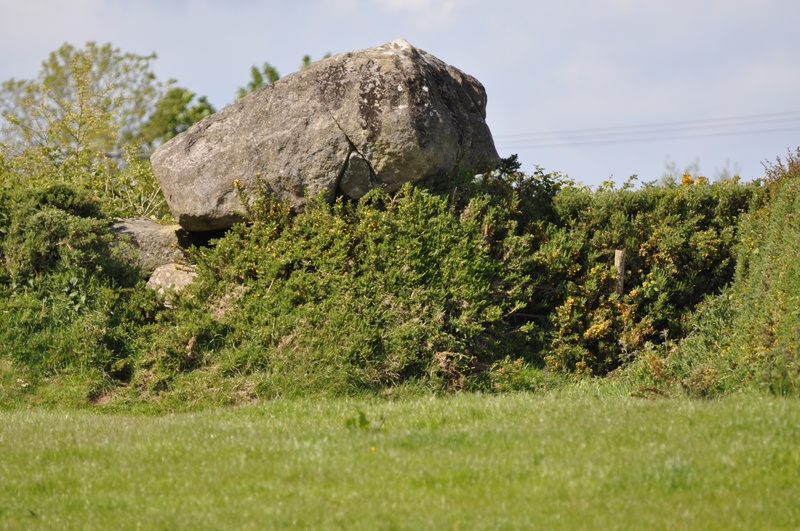 This kind of monument is known as a dolmen and is generally regarded as a burial chamber. The name “Kempe Stones” may come from the Norse Kampesten meaning “big stone”, but the PLACENAMESNI website also gives “warrior” as an meaning of kempe. Then there is the townland name. There is evidence from the 17th century that the townland was called Ballycloghtogall, which was derived from the Irish Baile Chloch Tógála meaning “townland of the dolmen”. 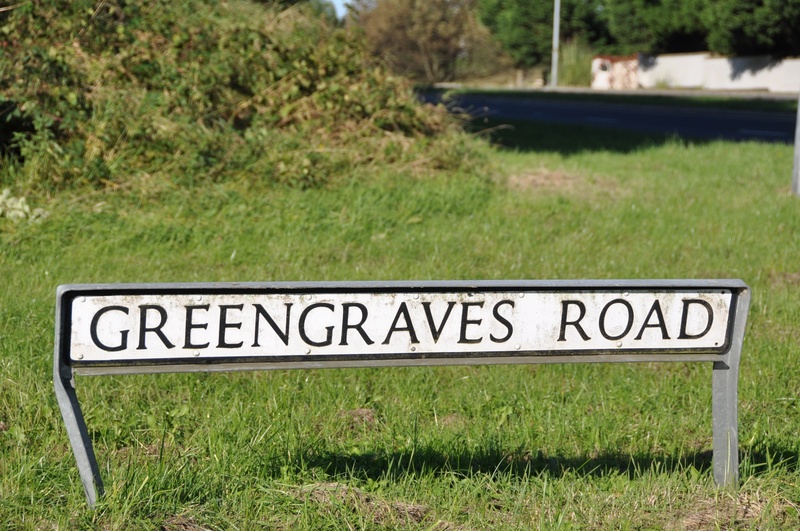 The green in the modern townland name of Greengraves looks like English, but may actually come from the Irish grian meaning “sun”. The PLACENAMESNI website suggests that it could be a corruption of “Grainne’s grave”, as Irish dolmens are frequently described as “Diarmuid and Grainne’s bed”, referring to the Irish legend of their elopement and pursuit by Fionn mac Cumhaill. How have burial sites developed since neolithic times? The next photo shows a grave from 1916 in Church Quarter. Fast forward to the 21st century: what is happening in Greengraves? Farming. 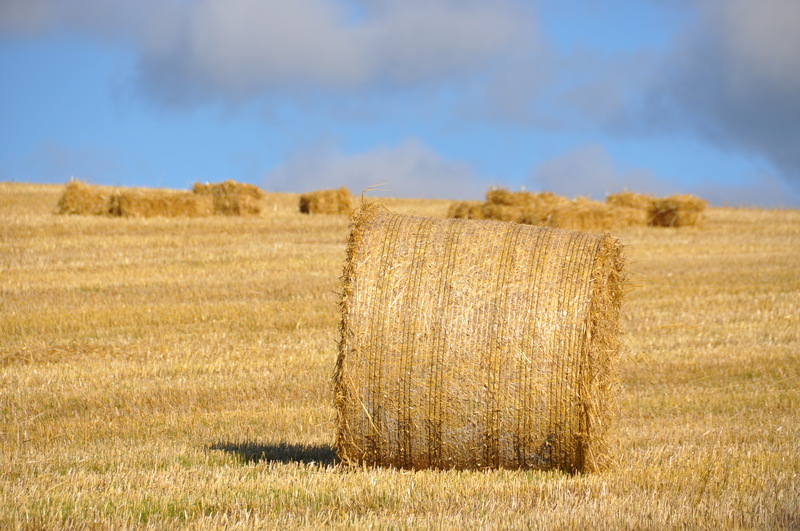 Here is the harvest of 2013…. 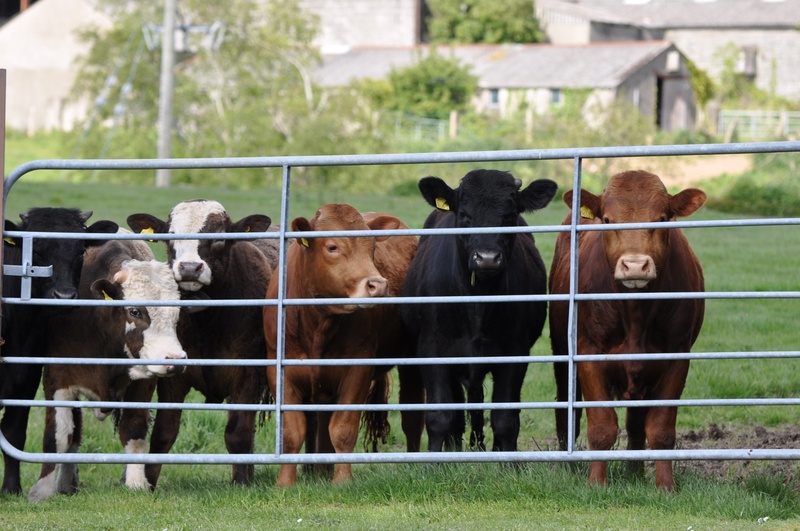 ….and here are the cattle of 2015, watching me as I take photos of the Kempe Stones. Click on these links to see more images of the Kempe Stones. 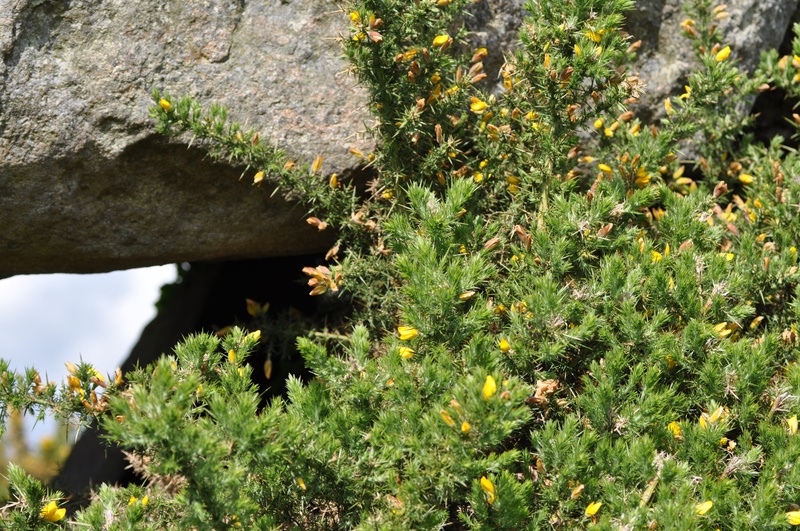 The Megalithic Portal – including a photo from 1902, with less gorse. Irish Megaliths – from the front page, I recommend clicking through to see the high-resolution close-up photos. Click here for a link to a 19th century map of Greengraves on the website of Ordnance Survey Ireland. Which townlands border Greengraves? To the north, Killarn. Then moving clockwise, Ballyrogan, Ballycullen, Ballyalton, Ballymagreehan, Ballyrainey, Ballylisbredan, Ballyoran and Carrowreagh. Which council area is Greengraves in? Ards and North Down Council. I am always fascinated by those old structures. Here in Germany you can find plenty of those giant stone slabs as well and the general view is always that they are burial places but who knows exactly?